In 2016, SMEs industry in Thailand has grown up to 5.3% to account for 41.1% of Thailand’s GDP. SME accounted for more than 80% of employment as well. This highlights the importance of SME in Thailand’s economy. Knowing this, Thailand 4.0 policy also encompasses the development of SMEs as well. With the aim to increase the value of SME GDP to be at least 50% of total GDP by 2021, the government plans to drive the growth of SME with three drivers: Active Cluster/Smart Farming, Smart SME and Global SMEs. To boost the growth of traditional SME markets such as Agricultural and Community enterprises, Active Cluster/Smart Farming is introduced. First, it aims to promote cluster to tap into potential that external economy of scale has to offer. It also helps the SME access funding via Village and Community funding, while provide training to SME’s owner as well as encourage usage of technology and Frugal innovation. Additionally, it centralises marketing effort by promotion via "Pracharat" store as well as encouraging e-commerce usage. For new growth industries, such as FoodTech, Health Tech, Auto Tech and Digital Tech, the government has put in place "Smart SME" project. The detail of this project is shown in the diagram below. To increase the competitiveness of SME for them to venture abroad, Global SME is used. This is done so by giving them International Market Expansion Grant as well as providing other incentives. Another area of this project that should be highlighted is encouraged the usage of market intelligent and usage of e-commerce in the foreign market. This is a good news for the IoT market. Firstly, E-commerce in Thailand is expected to grow tremendously as it is heavily emphasised by the Thai government. Recently, the Thai government has signed a deal with Alibaba to provide its expertise with the government is in e-commerce area. This includes providing training for SMEs in e-commerce aspect as well as providing guidance for setting up Thailand’s National E-commerce platform. This shows that Thai government sees the potential that E-commerce has to offer in Thailand and thus putting in significant effort in this area. 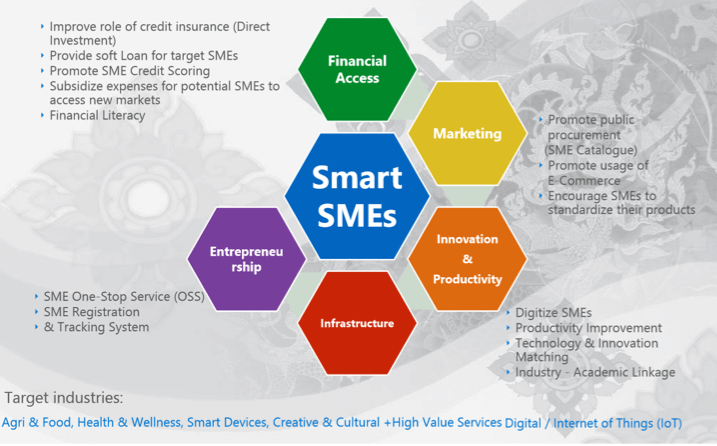 Secondly, the government highlights IoT industry is one of the key industries in Smart SME and Global SME project. It is safe to expect growth in local IoT industry as there will be incentives, funding, and training going into this market. International players can benefit from the projects as well as these projects highlight the importance of usage of technology in SME operations such as in Agricultural and Healthcare. This is illustrated in Thailand 4.0’s focus on smart farmers. Under modernization program, farmers will have to adapt or lose government aid. This will definitely push most of agricultural SMEs in Thailand to adopt digital technology in their production. The Thai government has invested a lot of effort in modernization and digitalization of SME to increase productivity and in turn promote digital economy. With government’s vision of transforming towards Thailand 4.0, it is safe to say that Thailand’s digital industry is in good hands.